How does news shape our world? This blog will explore what is happening in technology and media (both the amazing and absurd) regarding global news, journalism, crowd sourcing, storytelling, social media, online movements, and occasionally touch on other topics of interest. Join me! Hi everyone. It's been awhile. I have taken a hiatus but hope to begin posting more soon. In particular, more on storytelling and impact. Coming soon. Corruption Index -- Melding Journalist, Citizen Cooperation for Investigative Journalism! It has been a little while since I last checked in, but I do have something exciting to share. PRI, in partnership with the Center for Public Integrity (www.CPI.org) and Global Integrity (ww.globalintegrity.org) is embarking on an adventure combining investigative journalism, crowdsourcing, and government transparency and effectiveness, all in one package, the Corruption Index. (We announced this project a couple of months ago and are currently hiring positions to help make this happen.) The Omidyar Network and the Rita Allen Foundation are our primary funders for this project. The Project will hire political reporters in every state capital and rank the 50 states for susceptibility to corruption and will use the methodology developed by Global Integrity which previously developed a ranking system at a nation-state level, evaluating countries on key indicators that are essential to mitigate corruption. These learnings will be translated at a state-level. For example, political financing laws, civil service management and state budget processes will be reviewed. The project team will also create online data, reporting and technology tools to empower citizens to demand greater transparency and effectiveness. PRI will work with its 880 partner radio stations and key national programs like PRI's The World to inspire people through crowdsourcing and social media to take part in the project and spread the results. Its like an evolving, organic and living investigative journalism project in partnership with the public. I will give updates as we learn from this ambitious effort and will share the victories, failures, and learnings! If you regularly read my blog, you understand my desire to break new ground in the use of technology to transform who is telling stories (new voices) and how these stories can be told in the news media in powerful ways. In terms of texting, this desire goes far beyond the way that some content creators are using this two-way communications vehicle to ask if the "audience" likes something, or to vote this way or that. I am interested in how texting can be used to ascertain stories, perspectives and data that we would not have had otherwise, i.e., texting for crowd sourcing to add voices, context and relevance. In our program The Takeaway, which is co owned and produced by PRI and WNYC in collaboration with the BBC World Service, The New York Times and WGBH Radio Boston, made great strides in pushing this forward in 2010, through its Detriot and Miami texting projects, and won a Knight-Batten Award for Innovation for these efforts. To read more about the details of these projects, see my post from last year here. Now for the update that I have been meaning to post for some time. As you may recall, the big issue unearthed by our texting project in Mexicantown in Southwest Detroit was the fact that illegal truck traffic regularly barrelled through this neighborhood that sits on the border of the US and Canada, with the Ambassador Bridge as the primary artery. The neighborhood community has blamed the bridge and truck traffic for significant noise, congestion, high asthma rates, accidents/safety hazards and other quality of life issues. Trucking companies and the company that owns the bridge, the Detroit International Bridge Company, had come under some pressure, in part from our work to ascertain this issue, which had not been extensively covered in the media. The Takeaway and the local public radio station, WDET, got people together and used texting over the course of the project to text in license plates of trucks which were causing the issues so the community could develop plans to address and dialogue could begin. We told stories locally in partnership with WDET, and nationally had a dialogue on our program about transportation, affects on communities, and heard from voices on the ground. UPDATE: Last summer it was announced that the Detroit International Bridge Company, "extended an olive branch" by donating over $200,000 to open an expanded health center in the community. This is a great example of how technology can be an integral part in creating a virtuous loop of storytelling, discovery and data that can enlighten, inform, and impact the world for the better. How Can Journalism Regain Public Trust? The following presentation was made at the MediaTenor Agenda-Setting Conference in Rappersvil, Switzerland in October 2010. Good morning! 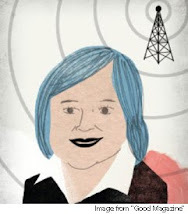 I’m Alisa Miller, President and CEO of PRI, Public Radio International. PRI is best known as a creator and distributor of radio content in the United States. But we are really an organization that creates news and storytelling content to help people successfully navigate our interconnected world. We recognize that it is imperative that people understand the rich diversity of our world in order to create a vibrant global society. Since 1983, we have provided different perspectives to ensure that our listeners had context for interpreting the news and making decisions. We are a leading provider of global news in broadcasting in the USA. We work in close partnership with the BBC World Service, the Canadian Broadcasting Corporation and 19 other US-based production partners. Our content is heard by 13 million people each week on over 880 public radio stations in the US, on Radio One in Canada, and right here on World Radio Switzerland. If you aren’t in the US, Canada or Switzerland, you can stream our content at pri dot org, download our podcasts or listen through our iPhone app. We all know that fair, quality journalism feeds people’s ability to make good choices in their lives. It lays the groundwork for action and potential for change. In our 27 year history, PRI has experienced a number of challenges and opportunities as media consumption changed, audiences’ needs evolved and new technologies were introduced. And now, like all of you, we are in an extraordinary environment that, every day, encourages us to think about how we can better serve audiences. Now, I’d like to talk about the environment in which we work, why journalism is more important than ever, and ways in which we can remain relevant as the world changes. As we all know, today’s media world can be discouraging. The unprecedented global recession applies budget pressures that have resulted in many for-profit media organizations, especially print publications, to fail; even organizations as prominent and established as the BBC are looking for new ways to do more with less. We also see an erosion of trust in the news media overall. For the fourth straight year, the majority of Americans say they have little or no trust in the mass media to report the news fully, accurately, and fairly. The 57% who now say this is a record high by one percentage point. On top of economic challenges, our consumers’ attitudes and expectations are changing. News users over 35 expect media to deliver the news from a position of authority; younger news users question that level of authority. According to a global survey of 18-35 year olds by the AP , and research by Christopher Sopher and his blog "Younger Thinking." cited by the Neiman Journalism lab at Harvard, younger news consumers want context for what is happening but may not see a consistent connection between regularly “getting the news” and staying informed about the issues that interest them. Advances in technology present another challenge: even as our traditional media is under pressure, we have to find a way to participate in all sorts of new distribution mechanisms: web-sites, podcasts, iPhones, iPads, mobile… it seems there is a new platform launched almost every day. These challenges are also the silver lining: our audiences DO want to know what is going on in the world around them. They are hungry for news. They want to be ACTIVE news users, and they have to technology to do so. What a great opportunity! A recent Pew report shows that Americans follow news most of the time. In fact, the demand for news according to a recent Pew study is at least in the U-S is the highest it has been in the last Decade . And finally, there is a growing contingent such as bloggers which is eager to create reports or POV content. A recent report in the Wall Street Journal says more Americans are now making their primary income from posting blogs online than those who work as firefighters or computer programmers. They have the ability to spread the word or be eye-witnesses to the news that is happening in their communities as we could see during the Iranian Elections and the Haiti Disaster. And 30-somethings around the world are consuming media 24.7. This graphic shows a day in the life in terms of the 30-something demo; It tells us when they want what, and why. You can see they use all kinds of media throughout the day to satisfy specific and different needs that change. The user moves from wanting information to building understanding. Note how the evenings provide a unique opportunity for multi-platform consumption – at the same time. The way users consume news is changing, but the desire to be informed and to know what is happening in the world is not going away. As a group, the next generation is more diverse and savvy technologically; their needs and demands as news consumers differ from previous generations. These listeners expect news on-demand, as well as the option to discuss or even shape the content of the news itself. They have preferences to share and comment and engage at higher percentages. Technology makes it easier for people to contribute to and consume news content. As users move from dial-up internet access (typical in America up until the beginning of this century) to broadband connections to integrated networked media, the content we create will be more and more accessible. Our media will be more driven by handheld devices and wireless networks. The challenge and the opportunity for our industry will be to figure out how to use this networked world to advance public service. This strong demand for news is encouraging, for it means that in the face of economic stress, people value journalism. Unfortunately, in the face of this demand, journalism is not meeting our users’ expectations. For example, US commercial television networks have cut the number of foreign bureaus by over 50%. The result, aside from one-person mini ABC bureaus in Nairobi, New Delhi, Rio, and Mumbai there are no network bureaus left in all of Africa, India or South America — places that are home to more than 2 billion people. Finally, a number of topics that really matter when it comes to how our society works and functions – education, science, the environment, race & ethnicity, women & children – often represent less than 5% of the total news output combined. This shrinking supply of comprehensive news journalism imperils our society, and our inability to meet audiences needs inhibit the level of trust between us. On a daily basis, we see an increase in the polarization of where people go for news, perhaps indicating a decreased desire to deeply understand our fellow citizens. In the U-S, as Pew recently found, ideology continues to be closely associated with people’s choice of certain news sources. Eight-in-ten Americans (80%) who regularly listen to Rush Limbaugh or watch Sean Hannity are conservative – roughly twice the national average of 36%. And at the other end of the spectrum, the New York Times, Keith Olbermann, the Daily Show, the Colbert Report and Rachel Maddow have regular audiences that include nearly twice the proportion of liberals than in the public. Many recognize this increasing polarization as a problem, and are working at an individual or organizational level to further understanding and compassion. As journalists, we have the ability, because of our reach and our historic role in society, to address this problem, by reaching out and engaging people across the spectrum. So, this is the crossroad which offers incredible opportunity for success: Demand is great, but media organizations are struggling to meet that demand. The increasing intolerance for different points of view requires action. Technology offers new ways to reach more people and encourage understanding. How do we take advantage of this convergence? I’d like to share some ideas for how journalism can succeed in this new landscape. First, we must re-establish trust with our existing audiences, and build it with new audiences by listening more and talking less. At the heart of journalism’s ability to give audiences the information they need to make informed choices about their societies is a level of trust. Unfortunately, this trust is not as strong as it has previously been, in part because of failures in journalism as mentioned above, and because of changing audience expectations. We have the ability to rebuild this trust by reaching out to better understand our audiences and make them a participant in our end product. At PRI, we have been turning outward to the communities we serve to learn more about the topics they deem relevant, and to understand more about their needs. This customer focus led us to create content that has attracted new audiences and expanded our reach. For example, in the early ‘90’s, PRI did research and found that Americans were hungry for international news, but the only international news they could find was lacking: it didn’t connect the dots between what happened abroad and what was happening in their communities. So PRI created, in partnership with the BBC World Service and WGBH Radio Boston, “PRI’s The World,” broadcasting’s only daily international news program that helps Americans understand how they affect and are affected by global events. “The World” is now heard by over 2.6 million people each week. Based on what we’re learning from The Takeaway, and as a result of new technologies that allow citizens to contribute to content creation, PRI is looking at ways of incorporating eye-witness accounts or crowd sourced fact finding and aggregation from listeners into our content. NOT as a replacement for the reporting from journalists, but as a new way to add context and relevance. By responding to our consumers’ interests and concerns, we are beginning to re-establish trust. They recognize that we want to serve their needs for in-depth news reporting and that we want their perspectives to flesh out our reporting. As a result, they are more engaged with us, more active and consuming more of our content. We are more relevant to, and more trusted by, our audience. We also need to deliver a more complete picture of the news that includes leveraging a news ecosystem that is far larger than our respective newsrooms. As we know, resources to support the creation of journalism are under significant stress. One way to address these constraints AND improve the quality of our reporting is by reaching out to a diversity of contributors and working with other media organizations that bring a different perspective. For PRI – a national organization – that means looking to neighborhood, local and regional media organizations. By collaborating with each of them, we have access to more capacity and are able to show the broader picture of any community. And our local partners, at their best will also tap into national and international coverage from providers and help to provide LOCAL CONTEXT to these larger stories. We also will actively partner with peer organizations at a national and global level as we have proven that combined resources and best thinking leads to the best product -- almost every time. We also need to challenge ourselves not to just go to the extremes in perspectives to tell the story from the left and/or right. This often leaves many trying to figure out what and who is the middle, which is another place where the facts and solutions could lie. This is counter culture to our coverage, particularly of policy. We also need to be serious about embracing civic reporting as part of our quiver to report and provide context of the news. People who are in our audience can and should be engaged to help us create our product, more than just supplement it. This will foster trust and will allow us to focus our efforts on work that we alone can do. Where are the spaces where we can pursue unmet content needs and let others do the rest. We need to be asking ourselves these questions. And we need to be providing tools that give people the opportunity to use the news and apply it to their lives. This will be the next wave providing relevance and breaking new ground in knowledge. And we need to harness the power of both actual and virtual communities to connect people at a personal level to the news, new ideas and each other, wherever they may be. Through the power of code and algorithms and user engagement, we need to create spaces for people to personally find relevance and connect with each other around content. For example do we even consider adjusting our approach and tone to new places, so as institutions, become members of those communities. For example, do you look at YouTube as a distribution outlet or a community in which your institution is a member, bringing your unique craft and perspectives. This difference how we see ourselves could dramatically change how people connect with your organization as a purveyor of knowledge and story telling. Or do we actively provide tools that give people the ability to find personal relevance of stories for their lives? Is this an integrated part of our editorial process today? It needs to be. As journalists, we provide information and context to help citizens make informed choices. Today, demand for our reporting is great… And so is the desire to identify issues of importance and engage with and contribute to traditional reporting. By listening to our audiences, we can re-build the trust needed to inform and support robust conversations about our world. This is our duty, and our opportunity. Let’s not fail to meet it. Key News Audiences Now Blend Online and Traditional Sources", Pew Center for the People and the Press, page 38 in the PDF. http://people-press.org/report/?pageid=1356. Audiences (18-34 year olds) increasingly rely on the Internet as a primary news source (“Abandoning The News,” Carnegie Reporter, Spring 2005). "Revealing the Digital News Experience -- For Young and Old". Nieman Lab, Harvard. "Americans Spending More Time Following the News- Ideological News Sources: Who Watches and Why", September 2010. Pew Center for People and the Press. "Study sees growth if NPR loosens up, sounds less elite." Published in Current, September 20, 2010. Over the years, a great passion of mine has been the power of storytelling in media and how it can engage people. Recently, I have been particularly excited by how the momentum of social networking and mobile technology can/could change who is telling the story, to whom and who can be moved by it. And I have some exciting progress to report! There is quite a bit of angst within some media circles that given trends in social media, and how quality journalism and storytelling is often practiced, that the American conversation on important topics (or any conversation bounded by a geographic or issue boundaries) doesn't become a medium of the elite, or speaking to the choirs, but a place where diverse people and points of view on the world can come together and enlighten us all in new ways. Ethan Zuckerman in his recent TEDTalk at TED Global, points this problem out very eloquently, Listening to Global Voices. Last fall, I began looking for a way to combine texting and content in public radio and reaching new users and listeners in new ways. Lets be clear, I LOVE smart phones and apps a plenty (I have too many to count). But if we talk about how to really open the flood-gates to add people to the conversation, regardless of status in society, texting is a much more equalizing medium. 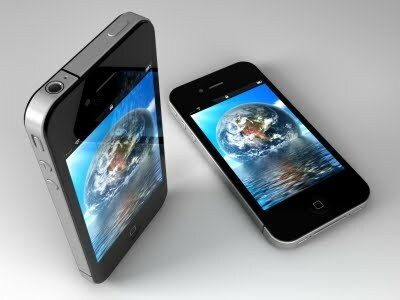 Nearly 300 million US mobile phones have the ability to text. So how can we incorporate a texting component into our story telling and engagement process, that is more than just,"tell us if you like something or vote for this or that"? It was a creative challenge that I was really intrigued with tackling. This is when I met Jed Alpert of Mobile Commons, a platform for mobile phones and texting. We got talking, and I was impressed with their work, which included working with content creators. But given PRI's role as innovator in content in public media and an organization that is built its operating model on partnership, I thought there could be ways that we could take this platform and take it to the next level, across PRI's programs, including The World and The Takeaway. We entered into a deal with Global Commons earlier this spring. Most recently, our program The Takeaway (co produced with WNYC and in collaboration with The New York Times, the BBC World Service and WGBH Boston), developed a pilot to reach out and engage new people into public radio, build community, and tell stories not told before first in Detroit and then in Miami. And here is a link to a video of a prototype idea we uncovered working together with the community in Miami. See more of these on PRI's YouTube Channel. And it was just announced that our work received a Knight-Batten Award for Innovations in Journalism! The Takeaway, WNYC and Public Radio International, New York, N.Y.
A team from The Takeaway radio show joined journalists from WDET Detroit in a successful experiment that prompted residents to text tips about particular stories from Mexicantown in Southwest Detroit. Residents texted information about trucks illegally barreling down their side streets, and in another experiment, they sent keywords describing their neighborhoods. The result: non-listeners became engaged and more informed. The experiment has continued in Miami’s Little Haiti. It is exciting to see how a small idea or hypothesis can come together fairly quickly and show promising results and perhaps more importantly, expand our learning. We obviously have more work to do, but it is great to see that this new way of reaching out and building stories is gaining recognition. We look forwarding to testing this further! Perception of bias or not is often in the eyes of the beholder. I thought this recent comment by GOP Conservative Tom Colburn (R-OK) re the reporting of Fox News was of particular interest. What do you think of Fox Coverage, or others? A picture can be a thousand words. I came across this compelling statistic. On Monday when WikiLeaks story/video on the killing of Reuters photographer by US forces in Iraq check out the comparison of coverage. Only 8 news stories appeared in Google News of the Reuters Photographer and there were 3389 article on Tiger Woods returning to the Master's Golf Tournament. 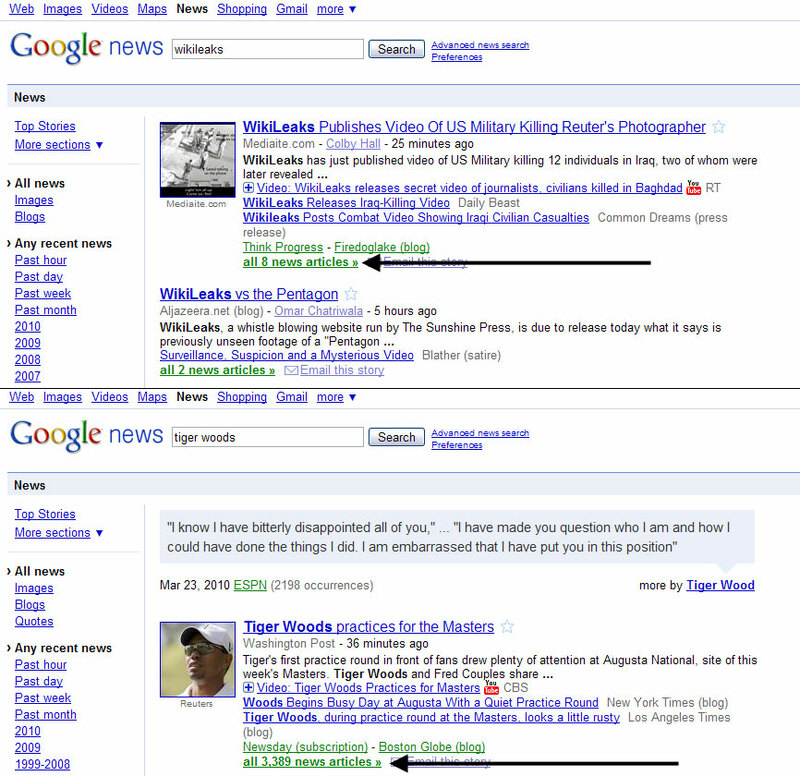 See link for image of Google results. In my "day job", I am President and CEO of Public Radio International. I oversee the development of some 400 hours of programming a week, bringing challenging content to millions of listeners and users. I advocate for a global perspective in news. I believe that while society becomes more globally interconnected, "Americans seem to know less and less about the world around them." (Symptoms include the closure of foreign news bureaus -- and the increasing share of broadcast time devoted to Britney Spears.) Diversity in reporting, I believe, is not just important -- it is vital for everyone who seeks to understand and act for good in an interconnected, increasingly complex world.